Welcome to Cornwall, England's westernmost county. The year is 1780, and the political and social atmosphere is as stormy as the sea that pounds the rocky shores. Into this landscape, Captain Ross Poldark returns from the American war to take up his inheritance and take up with his beloved Elizabeth. But with false reports of his death having reached Cornwall ahead of him, what will he find? And what of the young urchin Demelza, the new.. Welcome to Cornwall, near the turn of the nineteenth century, where an air of celebration pervades. However, even as Admiral Lord Nelson defeats the French fleet in the battle of the Nile, the situation between the recently returned Ross Poldark and George Warleggan is no nearer a conclusion. And things at home aren't much better for Ross, for Demelza is playing a very dangerous game with Lord Falmouth's nephew, High Armitage. A ride on..
Based on the novels by Winston Graham, "Poldark" follows the highly acclaimed 1970s TV series telling the story of Cornish mine owner, Captain Ross Poldark (John Bowe). Ten years have passed from the ending of the original series and, in this feature length edition, Poldark is now a Westminster MP. While Poldark is based in London, his wife Demelza (Mel Martin) and their son Jeremy battle to keep the family's mining interests alive. Whe..
It’s 1783, and Ross Poldark (Aidan Turner) returns home from the American Revolutionary War to a country in the grip of recession. His beloved Cornwall is on its knees. In his absence, his father has died, his land and mines have gone to ruin, and his childhood sweetheart Elizabeth (Heida Reed) is engaged to his cousin Francis (Kyle Soller). Feeling betrayed by everything he loves, Ross tries to rebuild his life with a new business vent..
All three series of the unmissable hit drama brimming with action, romance and set against Cornwall's captivating coastline. 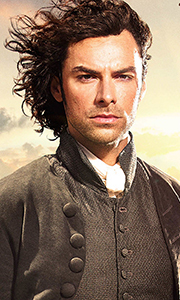 1783, and Ross Poldark (Aidan Turner) returns home from the American Revolutionary War. Ross' beloved Cornwall is on its knees, and in his absence, his father has died, his mines have gone to ruin, and his childhood sweetheart Elizabeth (Heida Reed) is engaged to his cousin Francis (Kyle Soller). Feeling betrayed .. Welcome to Nampara, Cornwall, in the 1780s, where a serious charge of looting a shipwreck in Nampara Cove leaves Ross Poldark in grave danger of losing his liberty. And when the Warleggans decide to foreclose on his mine and estate, his liberty's not the only thing on the line. If he's to survive, he must find the unmined lode of copper at Wheel Grace, and to do this he must find Mark Daniel, the only man to have seen it, who's now livi.. It's 1783, and Ross Poldark (Aidan Turner) returns home from the American Revolutionary War to a country in the grip of recession. His beloved Cornwall is on its knees. In his absence, his father has died, his land and mines have gone to ruin, and his childhood sweetheart Elizabeth (Heida Reed) is engaged to his cousin Francis (Kyle Soller). Feeling betrayed by everything he loves, Ross tries to rebuild his life with a new business vent..
Own Poldark Series 1 to 2 Blu-Ray from Deff, DVD, Blu-Ray & 4K Video Specialists - Free UK Delivery..
Own Poldark Series 1 to 2 DVD from Deff, DVD, Blu-Ray & 4K Video Specialists - Free UK Delivery..
Own Poldark Series 1 to 3 DVD from Deff, DVD, Blu-Ray & 4K Video Specialists - Free UK Delivery..
Own Poldark Series 1 to 4 Blu-Ray from Deff, DVD, Blu-Ray & 4K Video Specialists - Free UK Delivery..
Own Poldark Series 1 to 4 DVD from Deff, DVD, Blu-Ray & 4K Video Specialists - Free UK Delivery.. The smash hit Poldark saga continues with this second, gripping series. It's 1790, and there is riot and revolution in the air. Ross must fight for his freedom when George Warleggan (Jack Farthing) tries to have him hanged as a revolutionary. While Francis (Kyle Soller) and Elizabeth (Heida Reed) watch on in horror, can Demelza (Eleanore Tomlinson) save Ross from himself? Crippled by debts, ross and Francis try to heal old wounds by joi.. The smash hit Poldark saga continues with this second, gripping series. It's 1790, and there is riot and revolution in the air. Ross must fight for his freedom when George Warleggan (Jack Farthing) tried to have him hanged as a revolutionary. While Francis (Kyle Soller) and Elizabeth (Heida Reed) watch on in horror, can Demelza (Eleanor Tomlinson) save Ross from himself? Crippled by debts, Ross and Francis try to heal old wounds by join..
Own Poldark Series 3 Blu-Ray from Deff, DVD, Blu-Ray & 4K Video Specialists - Free UK Delivery..
Own Poldark Series 3 DVD from Deff, DVD, Blu-Ray & 4K Video Specialists - Free UK Delivery..
Own Poldark Series 4 Blu-Ray from Deff, DVD, Blu-Ray & 4K Video Specialists - Free UK Delivery..
Own Poldark Series 4 DVD from Deff, DVD, Blu-Ray & 4K Video Specialists - Free UK Delivery..